This is a Chinese name; the family name is Jiang. 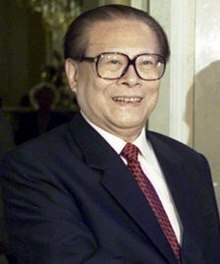 Jiang Zemin (Chinese: 江泽民; born 17 August 1926) is a retired Chinese politician. He was General Secretary of the Communist Party of China from 1989 to 2002, Chairman of the Central Military Commission from 1989 to 2004 and President of the People's Republic of China from 1993 to 2003. ↑ "Jiang Zemin – General Secretary of the CPC Central Committee". People's Daily. Retrieved 4 December 2010. This page was last changed on 4 January 2019, at 05:58.